Both Clare and Priscilla have been absent for long enough that it took a little while for me to get my head around their characters once again. Of course that’s still somewhat difficult, because neither of them have much of a motivation anymore aside from Clare wanting Priscilla dead. She even admits to that herself in this chapter, because in her mind there is no purpose for living other than revenge. She wanted to find Raki after being apart for seven years, but she managed to do that in the previous chapter. Unfortunately, I’m starting to run into the same problem I had with Ganta from Deadman Wonderland. There’s so little waiting for the character after this long battle is over that it becomes harder to care if they live or die. Priscilla is just as big of an dilemma, since she always felt more like a gigantic obstacle rather than a character in her own right. She’s like the dragon guarding a treasure who a knight must slay for the good of the kingdom. Except there’s no treasure, the kingdom doesn’t matter, and to quite a few people, neither does the knight. I had to look up some information on her just to remember what she was like, and all I found out was how much time she spent with Raki during the timeskip. I suppose this makes the final confrontation more interesting, but with how little of their interaction we’ve seen, it just doesn’t feel like enough to give her character meaning. I’m not going to say that the other girls are the deepest people you’ll ever meet, but it doesn’t feel like they need to be as much. This isn’t going to turn out like a typical shonen where every character gets a final opponent they had a history with. 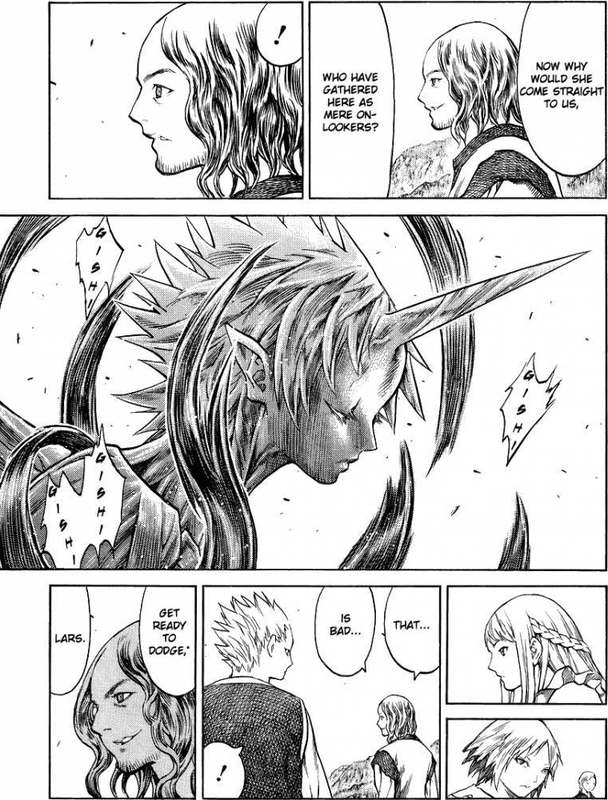 Besides, giving backstory and character to the other Claymore is usually what happens right before they die, so maybe they’re better off this way. It’s the meeting between Clare and Priscilla we’re meant to be invested in, but after over a hundred chapters since Priscilla’s introduction and several years of chapters with Clare absent, it doesn’t have the same impact. Plus, most of the attachment I have for Clare’s revenge is based on my feelings toward Teresa, rather than either of the combatants. To be honest, I don’t think I really noticed how I felt about this series until I started writing this. It’s very telling when you want to talk about the characters, only to realize you have nothing to say. Who would have thought taking the main heroine out of the series for two years would have such negative consequences? Maybe there’s still time for the series to make the reunion interesting and relevant again. But I’m beginning to think the damage has already been done, and the longer we have to wait for the series to finish, the worse things will get. 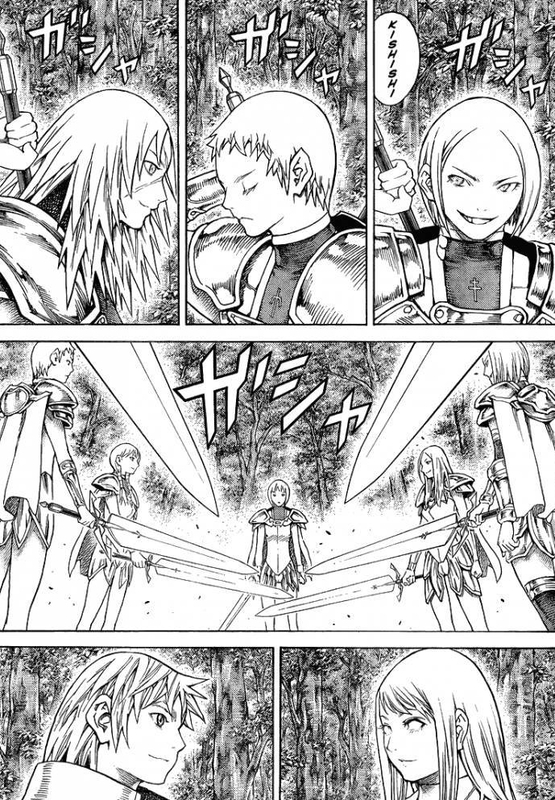 Posted on September 10, 2012, in Chapter Discussions, Claymore, Seinen Action and tagged Clare, Claymore, manga, Priscilla, seinen. Bookmark the permalink. 2 Comments. The reunion felt really rushed and made almost irrelevant. It feels like the author is rushing to the end of the series without any thought of slowing down when it’s necessary. Just by rushing the reunion, it feels like all the build up until now has been rendered irrelevant. Yes, I think this chapter should have spent much more time on just Clare and Raki catching up. After seven years, they should have a lot to say to each other that we just never saw.